Man is not free to choose anything in his life. He is brought to a group and led away from it. He doesn’t control this. What depends upon us is how we construct an environment that will cause each one of its members to be a useful, spiritual part. Therefore, it is said that the only free activity that depends on us is the choice of the environment. A person’s arrival to an environment doesn’t depend upon him since he is led there. And the choice of the environment means that at every given moment, I choose my maximal integration within it. Does the rest of humanity, people without a point in the heart, have free choice? No, they don’t. Only for us is there relative freewill in building the right environment and in the correct organization of humanity. Therefore, we have responsibility, both for us and for them. This responsibility is very harsh. If we don’t build the right environment for all seven billion people as much as possible, then we cannot advance because we are the upper part within the spiritual structure called Galgalta ve Eynaim (GE), and humanity is the huge lower part of creation that is called AHP. 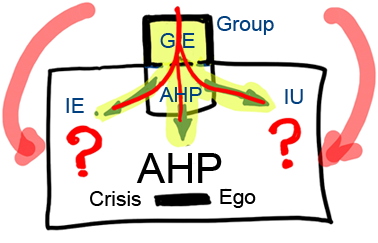 The upper part, GE, is our particular part, called our group, and its lower part is our AHP. It doesn’t belong to us, but it is something that we develop, the method of integral education and information, various courses, and so on. It is up to us to develop the subject, to act like adults, like teachers, in regard to the rest of the world, and in accord with the development of the world, it is up to us to bring the integral method and information to it with concern and attention. All the rest of the world will need to accept it because, in spite of it all, the Light has an influence on all of us in such a form that there is nowhere to which to escape. It influences the entire world and pushes it with the help of suffering because the AHP is its opposite (the world is a big, egoistic minus), and when the Light influences it, it arouses in it even greater negative feelings, crises, and sufferings. Ultimately, humanity searches for what to do, but it won’t find anything besides the Light that will be transmitted to them through us as a result of integral education. We need to create and construct all of this for them. Therefore, in addition to the group work in itself, it must also take care of all the rest to the degree necessary to awaken humanity, which is awakened to a serious question, not about the meaning of life for the sake of some lofty goal, but about the meaning of life in order to be released from the sufferings, from the crises. This is enough so that we begin to take care of them. When they discover their absolute helplessness, confusion, and inability to solve common earthly problems, and there is global awareness that they have no practical solutions, then we can confidently go out to the world and begin to look for the right ways of to whom and how to bring our method. After all, the world already requires this unconsciously, even though it is like a child that still doesn’t understand where, what, and how. It doesn’t feel that this is the key to a different existence, to a new reality, to a new dimension, because for most of humanity there is no point in the heart and for us there is, and we feel that something must take place here. There is some kind of a solution here. We feel it only slightly, just to the degree that the Light shines on us, and the Light has no influence on them. What does “it has no influence” mean? We are all in the field of Light, but they have no inner detector that can determine that there is some kind of illumination, that there are some kind of changes. We do have this detector; this is the so-called “sixth sense.” Therefore, everything depends only upon us. We have a responsibility for everyone. Moreover, we have received the opportunity to advance spiritually only in order to bring the whole world to this, and if we don’t convey the Upper Light through us and don’t convey anything through us, then we feel only a minute illumination, in other words, just a state of expectation, a neutral gear, and nothing more than this. Therefore, it is up to us to take this into account. It could be that there are groups with a good inner preparation. Its members study seriously, come to all the lectures and lessons, but they don’t want to go outside. Ultimately, these groups will transform into a barrier for the spiritual Light, and because they are linked to us, they burden us and damage all of us. Therefore, we must be careful, but still compel them, encourage and cheer them gently, trying to explain and attract them to this work. After all, this is needed from a global integral system. If this is a closed system, then you don’t have the right to abandon some part of it (even though this may not be a small part but about 99.99% of it). Even if it were only 1%,, even then you would not have the right to abandon them because if there is some uncorrected part of an integral, analog, closed system, then the whole mechanism is uncorrected. So if a need for correction is discovered in the world, you must think about all seven billion who require it and somehow activate the mechanism. The principle of the formation of all of our groups, or of the world group, must also include all of humanity because the time has come to uncover and reveal the general link between us. Prior to Abraham, only isolated Kabbalists had spiritual attainment. From Abraham and onward, it was groups, and from the times of Baal HaSulam and on, it is all of humanity. Baal HaSulam wrote in the twenties of the last century that all of humanity is one family. This suggests we must consider them as part of our group. Therefore, the principles and foundations for building the group must include this component: how can we interact with the whole world.